Excellent for all difficult types of Ethnic or Curly Hair. 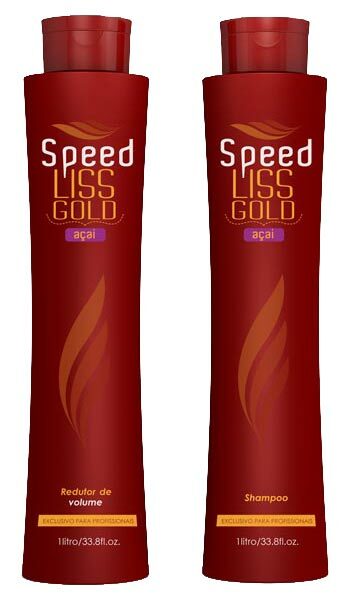 Description : Powerful volume reduction treatment, tames even the most unruly. Combine realignment of wires to a considerable replacement of keratin. Action : With action and extremely empowering condition, reduces the volume and makes the hair soft and easy to handle. Deep Cleaning Shampoo opens the cuticle, so the keratin can easier penetrate. The treatment strengthens the fiber and restores, straightens and disciplines damaged hair. The Mask conditions and closes the cuticles preserving the result. Keratin Contains 0.2% formaldehyde. Result : Hair up to 90% softer, loose, bright, with reduced volume and natural movement! Apply the shampoo to wet hair, massaging gently. Let the foam act for a few moments. Rinse thoroughly and repeat. Use lukewarm water. Remove the excess water from the hair by pressing gently with a towel. Remove about 70% to 80% moisture the hair with a dryer without brushing. Divide the hair into 4 parts. To do this, divide the head from ear to ear through the top of the head and divide this amount into 2 parts or 4 quadrants. The rest of the hair (middle and neck) is divided in half horizontally, forming 4 shares. Apply the volume reduction in thin slivers, starting at the nape. Keep a distance of 1 cm from the root. 80% Dry the hair with a dryer at warm temperature (without brushing). Realigning the strands with paddle brush, we recommend removing the nozzle of the dryer at this stage. Without removing the product, apply the flat iron at 210c temperature on thin strands of hair, stroking at least 7-10 times per hair strand to seal the cuticles.